Every day we hear about new businesses being built around Twitter . Corporations such as Dell are discovering that it is an ideal way to distribute marketing information about deals and and services such as TwtQpn makes it easy for businesses to create Twitter coupons. But who wants to follow Dell? Maybe for a week or two while you are in the market for a new computer, but then you have to remember to unfollow. And if you are really into finding deals, following every retailer you love is a sure way to turn your Twitter stream into a constant flow of spam. As a result, services are popping up to help you search for deals and coupons on Twitter. CheapTweet has already launched, and one that is in private beta is called Coupon Tweet. (To check out the beta be one of the first 500 readers to enter this code: TCBETA500). Coupon Tweet was developed by a Chicago firm called 12 Interactive, which is also behind employee discount site PerkSpot. It filters out all the coupon-related messages from Twitter, categorizes them, and and lets you search them on its site. The latest deals appear chronologically in a familiar Twitter stream. Tabs across the top allow you to browse through specific retail categories (apparel, cell phones, computers, tickets, travel). Deals can be voted up or down the page, or retweeted. (CheapTweet has similar functionality). The top three deals are featured items. 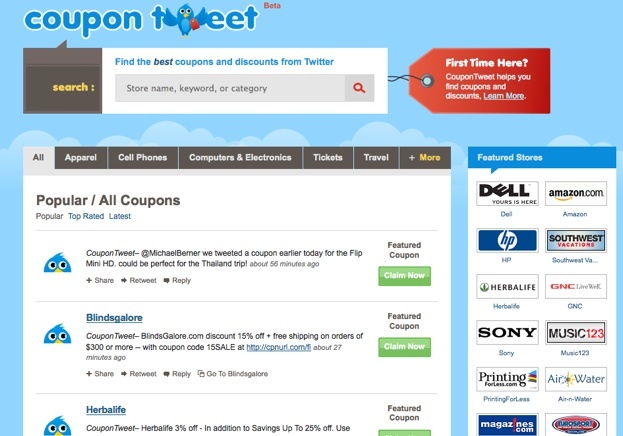 Stores can register with Coupon Tweet to ensure that all of the deals they Twitter are captured. Since the links go straight to the retailer’s page, Coupon Tweet can simply feature items from retailers with affiliate programs like Amazon to start generating revenue. And those slots could be sold to keyword bidders as well. Anyone can also follow @CouponTweet on Twitter to get a stream of the best deals of the day. How much of the total Twittering that goes one every day is commercial and are there really that many deals being Twittered every day that we need two services to keep track of them all? It is a tiny niche. Coupon Tweet founder Christopher Hill estimates that 4 million to 5 million total messages get Tweeted every day, and out of that he finds only about 1,500 coupon-related Tweets. He scrubs that down to 500 coupon Tweets a day, which comes out to about 0.01 percent of all Tweets. But you know what they say about early bird getting the worm and all that.